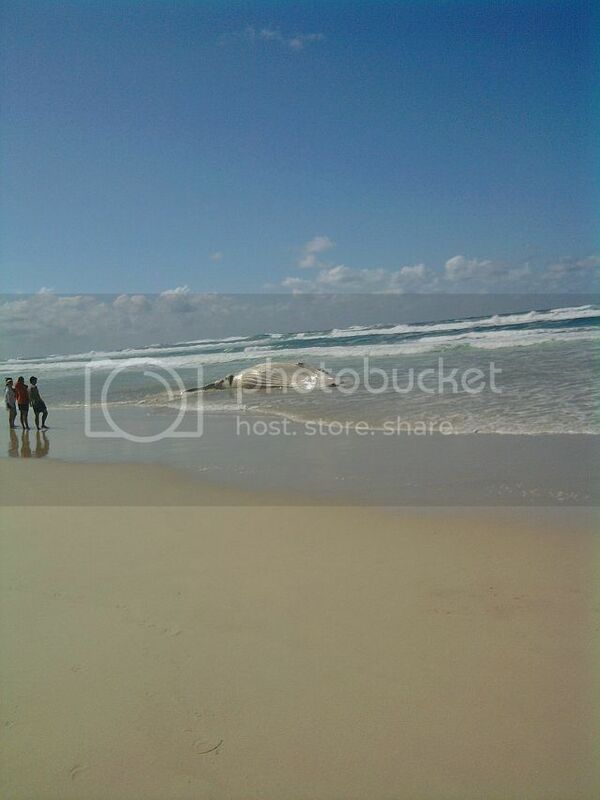 6 days on North Stradbroke. Friday 10th to Wednesday 15th. Friday was great. Saturday reasonable. Sunday and Monday, strong wind warning and high seas. Tuesday and Wednesday were perfect with the tailor wanting to play. This is looking south from camp 13 to the Pin. Sunday arvo with 2 and half hours before full tide. 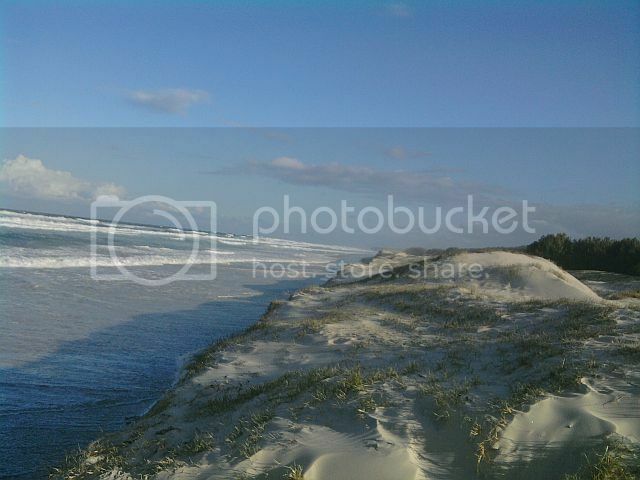 Not a lot of beach left. Sunday morning we went for a drive from the camp down to the Pin. Tried to fish but even around the corner the wind and swell were against us. There were 2 RESCUE cats going back and forth, halfway out the bar and back again. We thought they were having a play, training exercise, in the rough conditions. After 40 minutes or so of getting blown sideways and wet crotches we decided to head back to camp. Just around the second corner we came upon this. No one about. 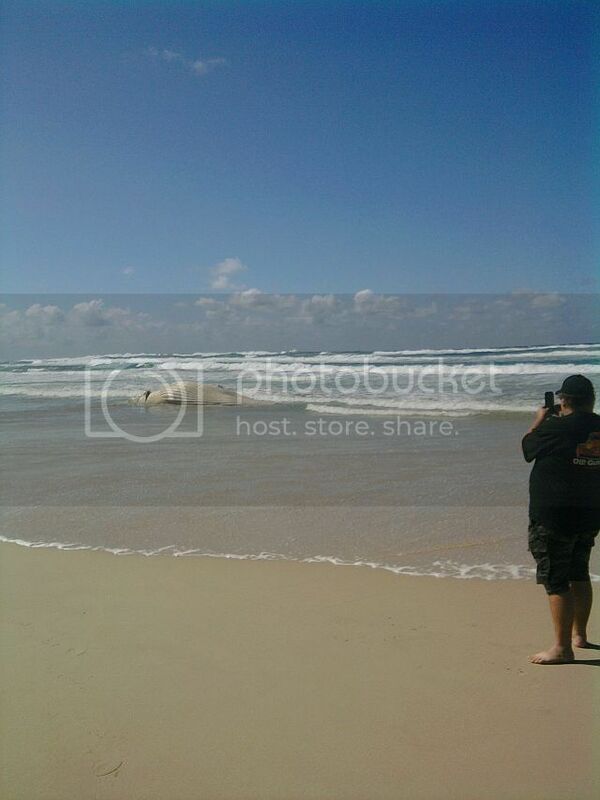 We couldn't see anyone in the surf. Then we saw the thick rope and loop tied around the motor leg. Maybe the rescue cats weren't playing. A strap over the hull and we had it back the right way up. A couple of rods in the side holders and a set of car keys still in the side pocket. Hit the trim button on the side of the 40hp etec and up came the motor. 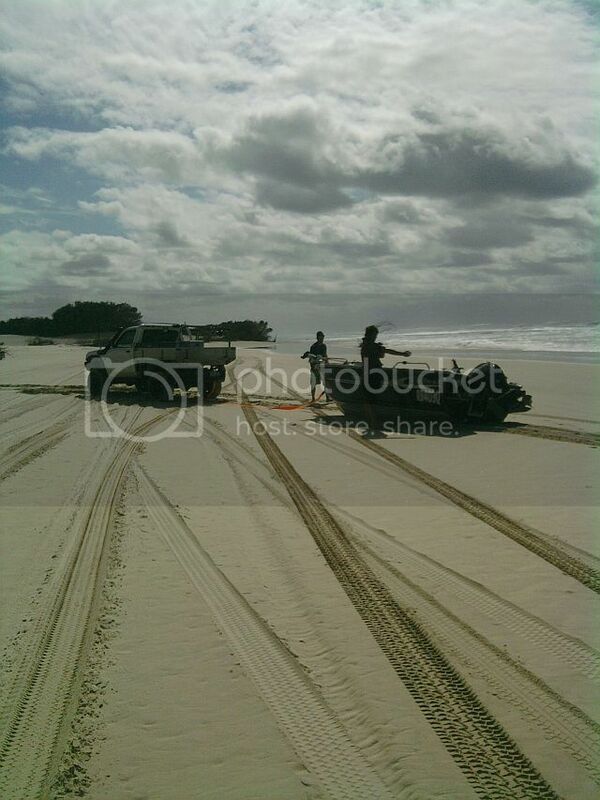 A young bloke with us in his lifted and locked patrol then dragged it as far up the beach as he could get it. While all this was going on, I was on the phone. The only one with reasonable reception. The closest VMR number I had was Cleveland. The bloke took all the details and said he would get back to me. 2 minutes later I get a call from Jacobs Well Water police. Details again and he advised to get it as high up the beach as we could. Which we did. No more than 10 minutes later I get another call from Jacobs well police. Would I like to speak to the owner? Him and another bloke were drifting around on the electric, well inside the bar, when they both ended up in the water. 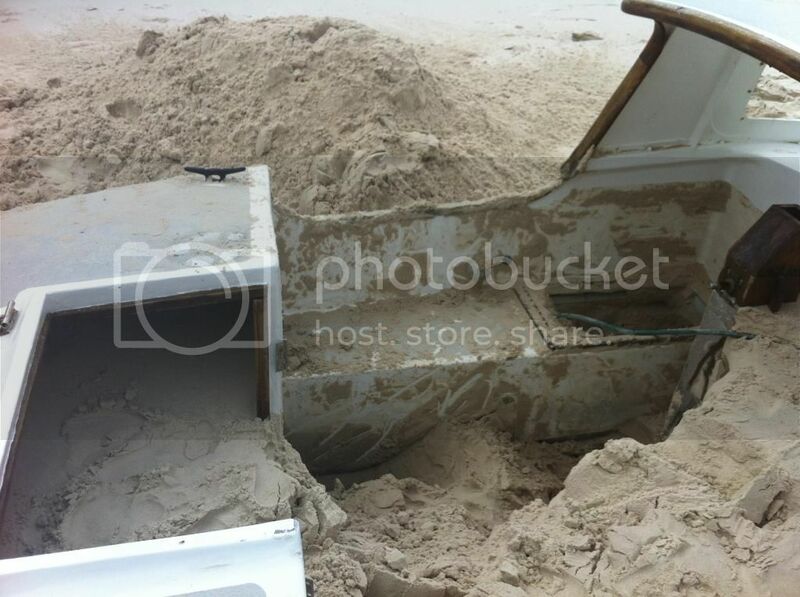 He didn't say if the boat had flipped or they were thrown out. They were rescued but it looks like the boat could not be properly taken under tow, upside down, in the conditions. It had drifted too far into the bar. 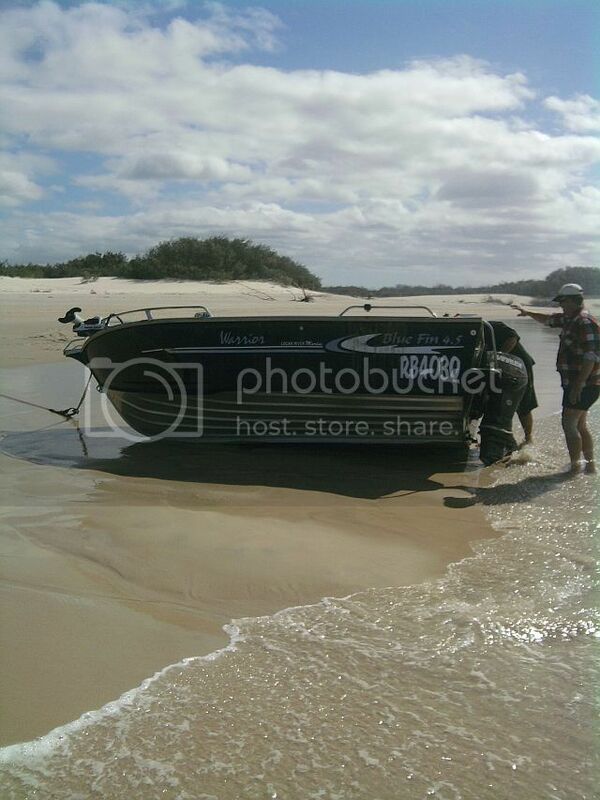 The owner said he had arranged for a recovery from Point Lookout when he was told the boat had been found. On Monday we did a beer, ice, bread, prawn run to the top end of the island. On the way back we passed one of the commercial guys towing the boat north on a too big trailer. Hope he was the recovery unit. 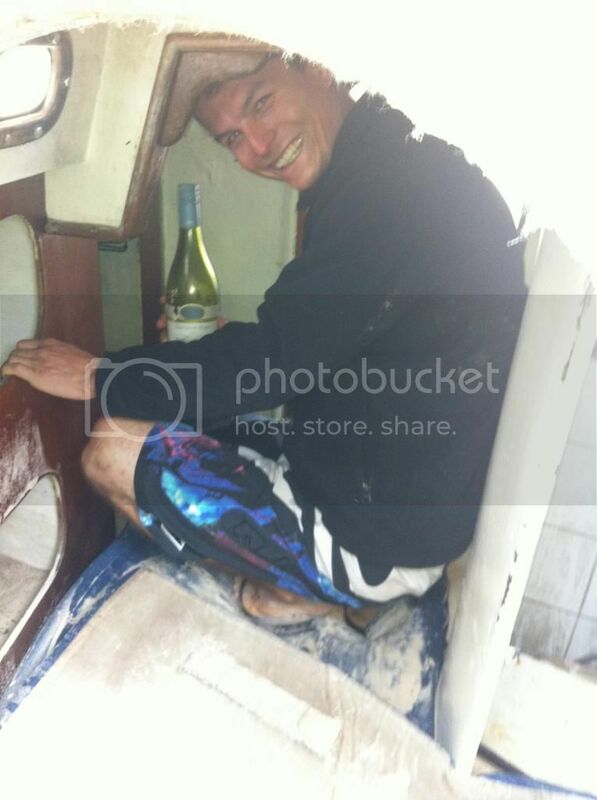 So if you are reading this Blake, you and mate are lucky people and I hope you got the boat back. We also saw this on Monday. 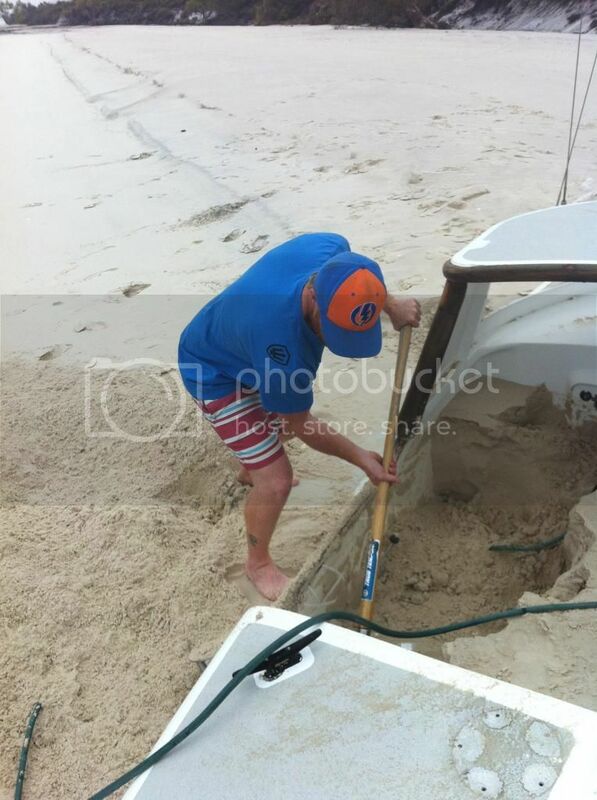 Apparently it had been buried on Thursday but the worms, err, high seas had dug it back up. Sounds like you had an adventure filled trip! Glad to hear that it sounds like the boat has been returned to its rightful owner. Good on you StraddieTriton. Great story; great result. Not exactly washed up on the beach, but . .. 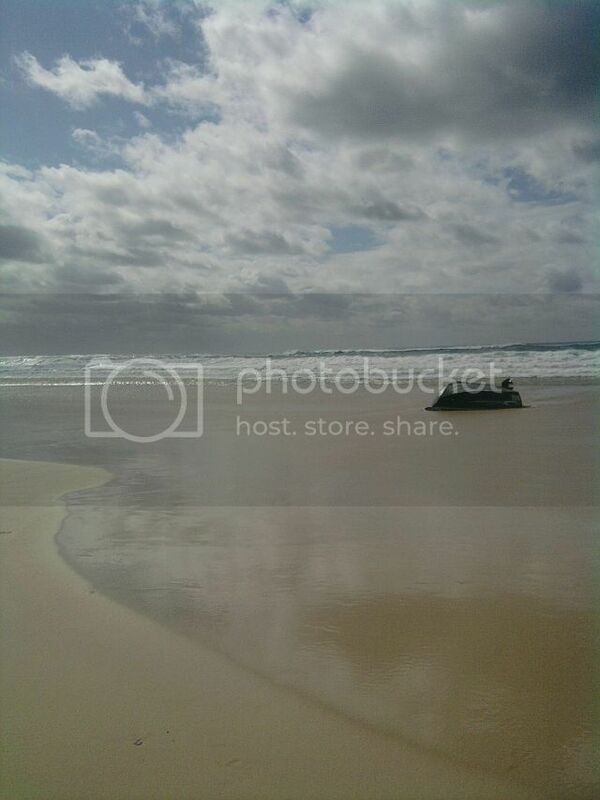 They found a ww2 bomb on stockton beach today. that would have give the old 4by a lift if someone had run over it!! What a Cracker , the name is very appropriate . We found this yacht on the western side of fraser a few months back. 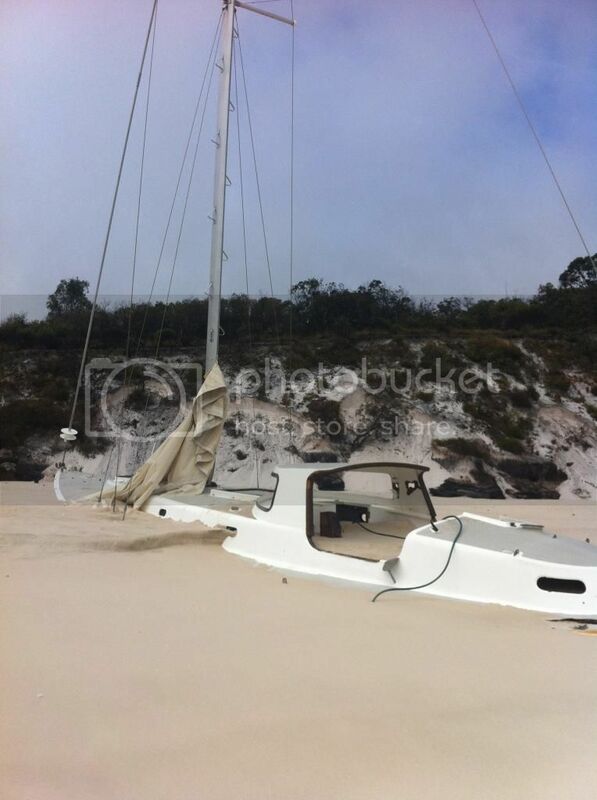 I suspect it was a QLD floods victim, might has broken its mooring and floated away and got caught on the beach. Was a good find, kept us occupied for a while. I found a dead piglett at burns beach once,looked the one off that movie babe. won't be happy.Bogged past the sills and completely underwater. They where new when this happened. 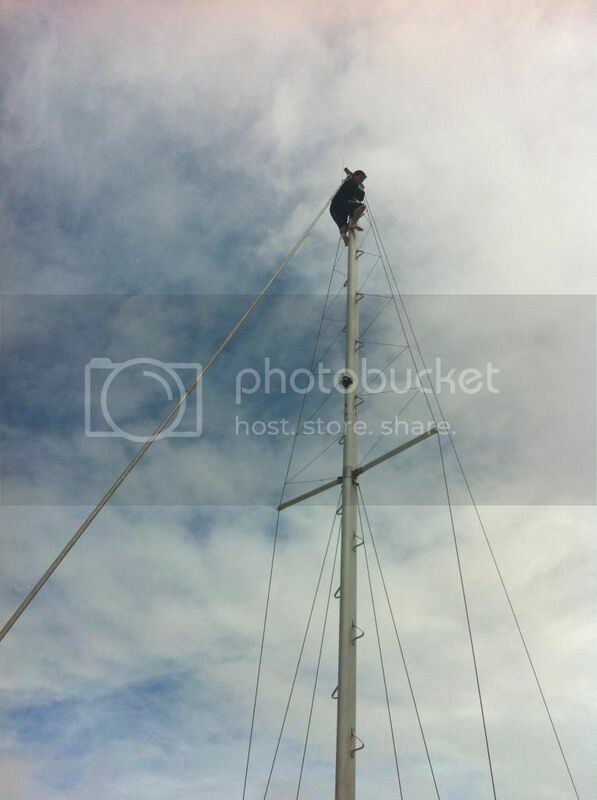 Nags, the mast and rigging was all gone from her in October when I saw it last. The hull is now exposed as is the coffee rock she landed on. The westerlies scoured out around it. Strong smell of diesel too. hah - Reminds me when living on Westmoore Isl in 2007/8 and a steel shipping channel marker from over Johns Creek way drifted past the island!. I rang marine safety (Marine & harbors / whatever) & mentioned i could see the huge steel shipping channel marker drifting past the island headed for Madagascar or somewhere! Dunno probably weighed maybe 10 tonnes!. So they say - "can you take it in tow for us, cos they cost a bomb to replace"? Well my boats maybe 2.5 tonnes... and if the weather tides wind turns bad something that heavy could pull the transom out so its not without "risk" to do this... and if it goes wrong - who's going to pony up ~ $150K to replace the boat? Not these Govt pillocks... they wanted me to tow it 35 Nmiles back to where it came from for them for free! (Then make my own way back to the island another 35nmiles). Did I mention O had to buy all my own fuel and at $2 a liter back then plus haul it out from Karratha and take it over the the island in 1000 liter IBC's? Bout an hour later I see a commercial 60 foot salvage cat flying past the island out of Pt Sampson at warp speed hunting down the missing shipping channel marker (For the Lambert loading dock). Spoke with him later - they had to pay him over $20K to get it back! The thing is - they actually charge me annually a few thousand bucks for "provision of navigational markers"....(and boat ramps and every other bloody thing) and where I was there was not ONE marker or boat ramp within 30 odd miles!. They happily paid someone else much more than I'd have charged them when I reported it - If I hadn't reported it they wouldn't even of known they had lost it, until a ore carrier ran aground in the dark!. I just shake my head at these pillocks some days!. The wonder why no one wants to help them out! It's just how govt office workers think....(or don't think).